Mocak Café can be found in the Museum of Contemporary Art in Krakow, located on the site of the former Schindler factory. Take a break and relax when visiting our exhibitions. Mocak Café is open to all, and not just to MOCAK visitors. It stays open on Mondays, when the Museum is closed. Try our excellent coffee, or a colourful long drink. Get away from the din of the city centre and its crowded clubs. 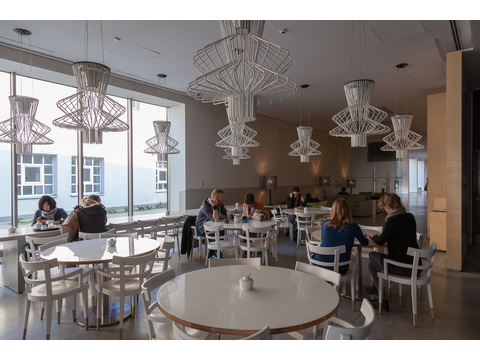 Mocak Café is a perfect place to work quietly on your laptop, read a book or talk business. On a hot day, enjoy our cosy garden.